envelope › Buy Poster of Blank postal envelope with postage stamps and postmarks on white background vector illustration. Stamps set with world famous architectural composition. Postal services. Envelope delivery. Gift envelope. Souvenir of trip. Travel souvenir. Envelope layout. 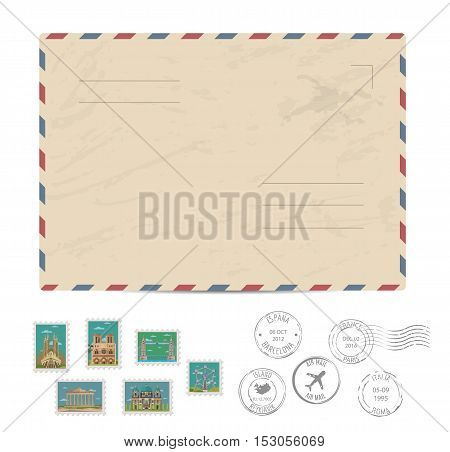 Poster of Blank postal envelope with postage stamps and postmarks on white background vector illustration. Stamps set with world famous architectural composition. Postal services. Envelope delivery. Gift envelope. Souvenir of trip. Travel souvenir. Envelope layout.